Decorated page, from Poems (tarji'band), Walters Art Museum Ms. W.651, fol. 2a, originally uploaded by Walters Art Museum Illuminated Manuscripts. This is an illuminated and illustrated manuscript of a small collection of short love poems of the type called tarjī`band by Nūr al-Dīn ‘Abd al-Raḥmān Jāmī (d. 898 AH / 1492 CE). It was copied in black nasta‘līq script by the calligrapher Muḥammad Zamān al-Tabrīzī in 998 AH / 1589-90 CE in Safavid Iran. The text is written on orange tinted paper and the bluish-green borders are illuminated throughout. The manuscript opens with an illuminated incipit page with a headpiece (1b) and there are two illustrations (3a, 6a). 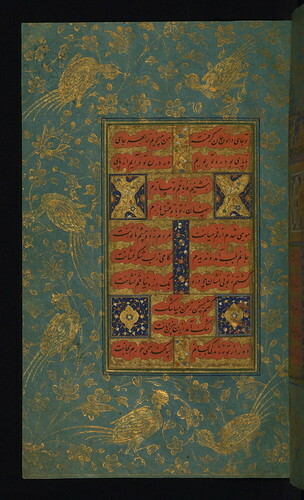 The Qajar lacquer binding is decorated with floral motifs and is inscribed with verses attributed to Imām ‘Alī ibn Abī Ṭālib. This text page is written in nasta‘līq script on orange tinted paper by the calligrapher Muḥammad Zamān al-Tabrīzī in 998 AH / 1589-90 CE in Safavid Iran. The bluish-green borders are illuminated in an early Safavid style.